of modern décor and genuine hospitality with the latest technology. 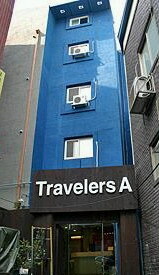 TravelersA offer comfortable,safe, spacious guest rooms and superb location for seoul tour. • Towels, Sampoo, Linse, Soap, etc.. Copyright © 2009-2017, TravelersA Korea Hostel, Inc. All rights reserved. No part of this site may be copied, displayed or reproduced without the express written content of HAN Development.